Figurative Sculpture: A figurative sculpture displays a close physical representation of a human being or animal form. Statue: A figurative sculpture that is full-body, lifelike, and typically half-life-size or larger. Statuette: A figurative sculpture that is full-body, lifelike, and not only less than life-size but small enough to be easily lifted. Very small statuettes are also known as figurines. Bust: Figurative sculpture of head and shoulders of a human subject. Plinth: Base on which statue is erected. Wide variation possible in both height and shape. Inscription: Interpretative text added to a sculpture or its surrounds, often by means of engraving the plinth itself, or via a plaque that is then attached to the plinth. When applied to a statue, it typically contains the subject's name and/or a title for the statue, along with the date of unveiling, the name of the sculptor and, for commercially funded statues, the names of the funders. A tribute to the subject, through praising their personal qualities or a more prosaic list of achievements, may also be added. Maquette: A maquette (from the French ‘scale model’) is a small scale model produced by a sculptor to test design ideas and sometimes to encourage interest and support from those who commission the sculpture. Bronze: Bronze is an alloy of copper and tin and is generally composed of 88% copper and 12% tin. The frequent choice of bronze for use in statues is due to its strength, resistance to wear, ease of working, and its ability to maintain its appearance over many years and millennia. Patination: Patination is the process of applying chemicals to the surface of the bronze in order to give it a specific finish or colouration. The application of the chemicals can be hot, cold or buried. With hot patination the surface is heated and then the chemicals are applied with a brush, spray or dipping. Similarly, cold patination involves the cold application of the chemicals and buried patination requires the statue to be immersed in the chemical. Once the patina is completed wax is rubbed into the surface to protect the finish. Diptych/Triptych: Statue featuring 2 or 3 figures respectively, as opposed to the more usual single figure. More generally an artwork that would be viewed and considered as a single artwork, but comes in 2 or 3 separate but mutually dependent parts. Statue Group: Statue featuring multiple figures that are arranged in close proximity, typically but not always interacting. Lost-wax Method: A method of casting metal sculpture; one of the most common approaches used to cast a bronze statue. First, an original sculpture is made of clay or another malleable material. Next a negative mould of the original sculpture is made, often of plaster. This negative mould then has wax poured into it to create a second sculpture or positive. The wax sculpture then has another mould constructed around it of ceramic and is then placed in a kiln causing the wax to burn away leaving a second negative mould, hence the lost-wax method. The molten bronze is then poured into the space vacated by the wax and the final statue is produced. This website aims to eventually record all figurative statues of sportsmen and women, that have been erected primarily to honour of their achievements in sport. Though our associated research is primarily interested in subject-specific statues, we will also be recording statues that depict non-subject-specific sporting participants or fans in action. A further criterion is that the statues are, or have been publicly accessible, or at the very least publicly visible, and are intended to be permanent installations. We aim to record statues that have fulfilled these criteria at some point in time, even if they have been subsequently removed, stolen or destroyed. Busts (though we have made exceptions for the rare occasions where a bust is extended to include the full torso e.g. Steve Bloomer). Statuettes and figurines (we have taken the dividing line between statuatte and statue to be approximately half-life-size). 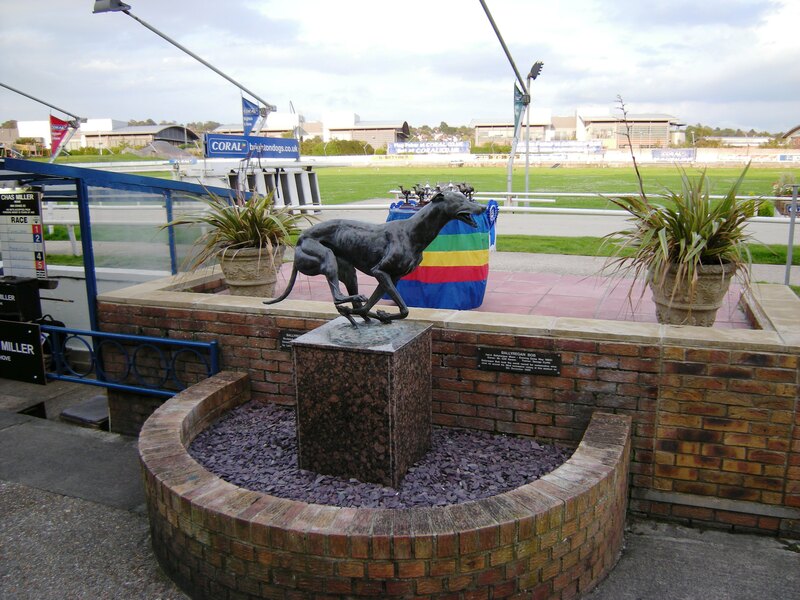 Figurative statues of non-human sporting particpants, such as racehorses or greyhounds. Sorry 'Dessie', sorry Ballyregan Bob. Figurative statues of people who are not associated with sport in any way, but happen to be located at or near to sports grounds; for example, the controversial statue of pop star Michael Jackson at Fulham Football Club in London. Figurative statues of subjects who may have been involved in sport at some point ion their lives, but are primarily famous for, and are being honoured for some other achievement e.g. the statue of Sir Arthur Conan-Doyle (honoured for being the writer of Sherlock Holmes stories, but who also happened to play first class cricket). Wax or resin models used as temporary exhibits in museums or visitor attractions such as Madame Tussauds. Statues that were private commissions or purchased upon creation by private individuals, and have never been displayed in a publicly visible setting. An example would be the statue of Roger Bannister held by a private individual in Warwickshire. A further issue is the question of when a statue or statue group featuring multiple figures is classed as a single statue or multiple statues. We have applied the following guidelines, though it is still sometimes a grey area! Where the figures are all on the same plinth it is classed as a single statue. Where a statue group contains figures that are anonymous sportsmen and/or sportswomen (i.e. non-subject specific) it is classed as a single statue. Where a statue group contains figures that are subject-specific but are clearly arranged as a team group, with a single plaque honouring the team, it is classed as a single statue. Where a statue group contains figures that are subject-specific, are not on the same plinth and were unveiled seperately (i.e. different dates) they are classed as separate statues. Where a statue group contains figures that are subject-specific, are not on the same plinth and are not interacting they are classed as separate statues. Where a statue group contains figures that are subject-specific, are not on the same plinth and have their own separate plaques to acknowledge their achievements they are classed as separate statues.